Comfortable, relaxed test intervals of up to 40 minutes allowing time to perform additional tests, discuss requirements and needs or provide explanations following the eye test. Digital non-mydriatic Topcon retinal photography is included in all our examinations. Unlike a lot of the larger opticians, we do not have members of our support staff performing any ‘pre-screening’, in order to ‘speed up’ the eye test. We feel these important tests such as measuring the pressure and performing the visual field test should be undertaken by the optometrist, only performed if deemed necessary and appropriate for you and performed within the privacy of the testing room. This does mean that we dedicate more optometrist time to you than you may had elsewhere so please allow around 40 minutes for the duration of the eye examination. If you are new to us please remember to bring a list of your medication, your previous prescription (if you have it) and all your spectacles. If you are referred to us via the NHS triage referral hub for an enhanced refinement of another optician’s referral please also remember to have your NHS number with you as well. Allowing additional testing time allows us to discuss your visual needs and requirements more comprehensively, as well as performing an often wider range of tests more tailored to your visual and occupational needs. This ensures the most accurate and appropriate visual correction that you may need. We refine all of our clinical tests including pressure, visual fields etc. 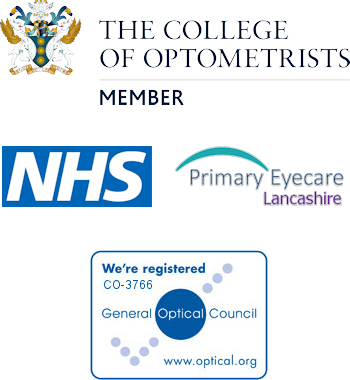 (including refining other opticians referrals as well) to ensure an enhanced accuracy of all our clinical findings. We place high emphasis on the continuity of care. Screening of conditions such as glaucoma, require careful analysis of optic disc changes throughout the years. This is further enhanced by utilising our new 3D OCT retinal scan. Having the same optometrist check you every year, in addition to our included fundus imaging & our OCT scan, mean that the accuracy of our assessments are much improved. Should you be found to need some optical correction we can advise you on the most appropriate option. The appearance of the glasses are often seen as the most important aspect however the various dimensions of the frame as well as its fit and positioning are often overlooked but need to be taken in to consideration. We also supply a very large array of spectacle lenses across several UK lens manufacturers. Successful fitting comes from an appropriate frame, correctly fitted and adjusted with an appropriate lens choice. We are here to help and advise you on this sometimes complex area and we have the time to do so. All are dispensing staff are either qualified dispensing opticians or doing the dispensing optics training. We do not have optical assistants performing our spectacle dispenses. We offer digital non-mydriatic Topcon retinal photography with every eye test we carry out at James Bontoft. Using a specialist camera we are able to take a digital retinal photograph of the inside of your eyes. The picture is a detailed image of your retina (the back of your eye), which can reveal a lot about your eyesight and your overall wellbeing. It’s also a permanent photographic record of your eye health so we can review it when you come back to see us next time. We also have the ability to photograph & video in high detail the external surface of your eyes. This is useful for explanation of any external eye disease and for itsongoing management.